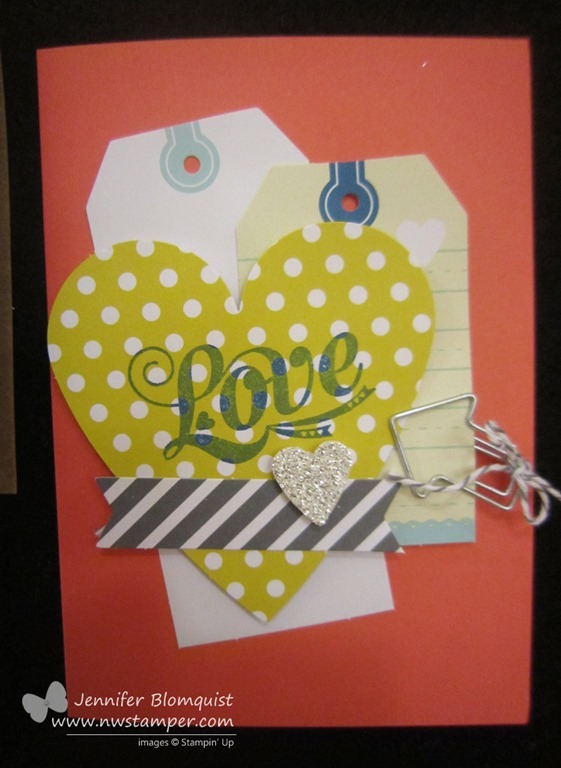 Can I share with you this project that we are making in my Birthday Card Kit and Organizer class this weekend? 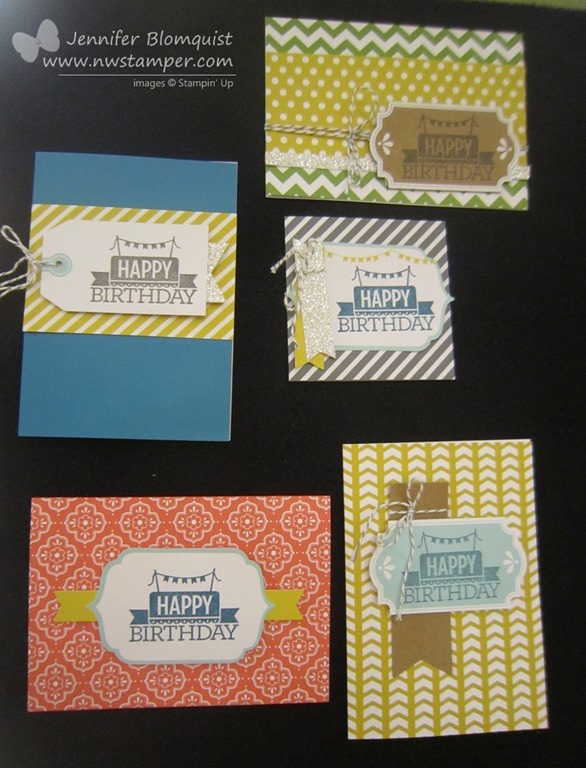 Isn’t it such a fun and cheery birthday collection? 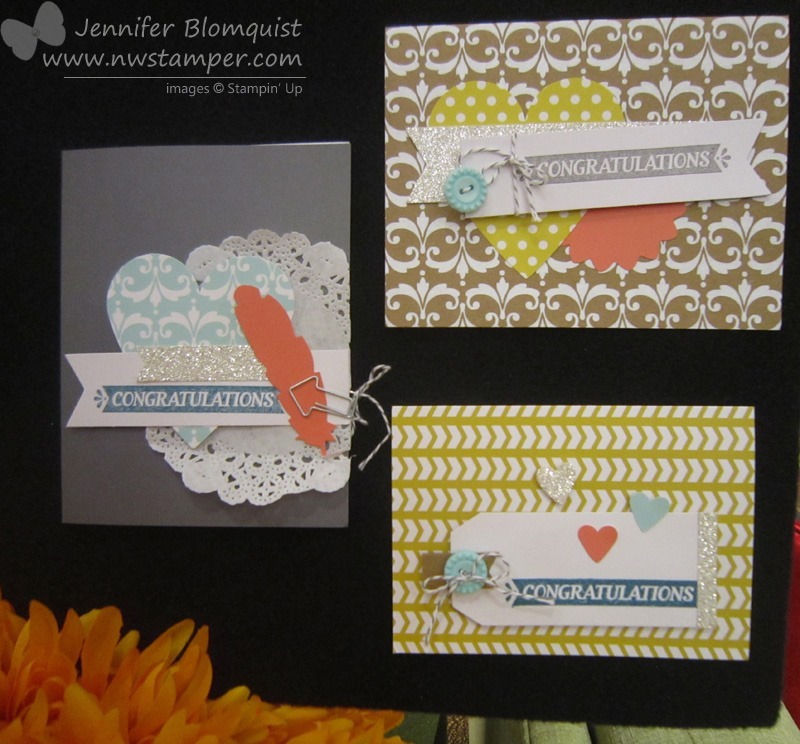 I had so much fun when I made this sample and I loved all the fun but simple ideas that we use on the different cards. What you are seeing above is a fun desktop organizer with two storage compartments. 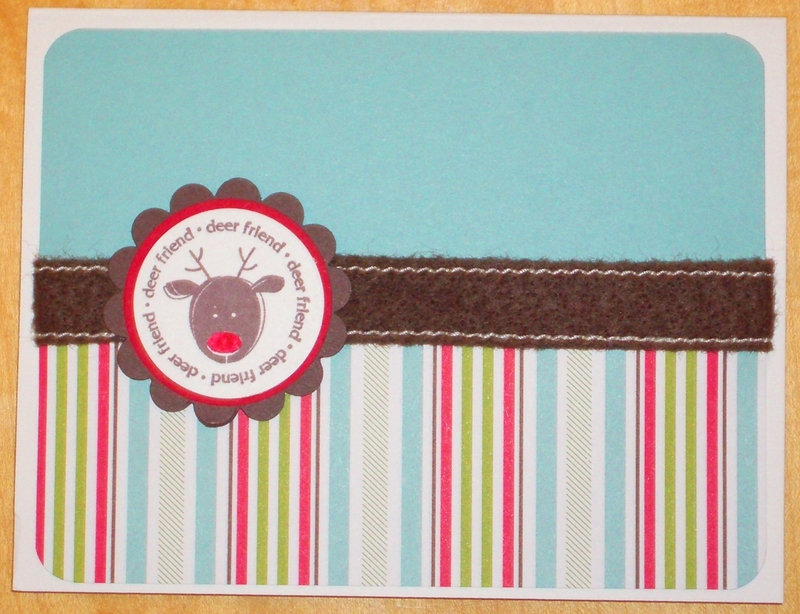 The front compartment is perfect for holding gift tags and 3×3 cards. The top compartment is exactly right for holding standard sized cards and envelopes. There is even a special spot for storing a coordinating pen! 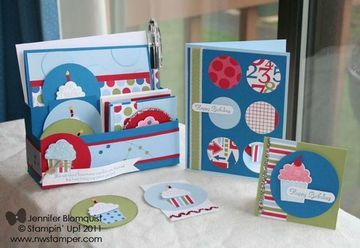 All of the pieces of this project use the fun Create a Cupcake stamp set and the Build a Cupcake punch. In the class we’ll be making the box, the matching pen, 2 full sized cards (with envelopes), 4 3×3 cards (with envelopes), and 4 gift tags using this punch set, some of the chunky glitter, ribbon, and some extra punches. I’m so looking forward to it because even though I know it is a lot, I know folks will enjoy and love having so many items ready for last minute birthday gifts and parties. If you are in the Bay Area and would like to come join us on Sunday afternoon for this class, let me know and I’d love to add you to the rsvp list! 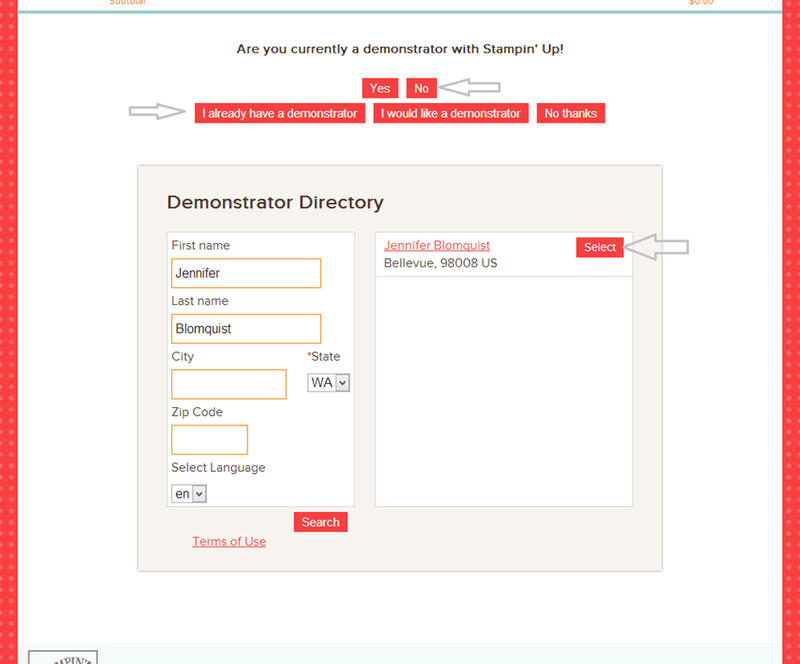 Email me at jennifer@nwstamper.com. You just need some adhesive, glitter, and stamps as desired. 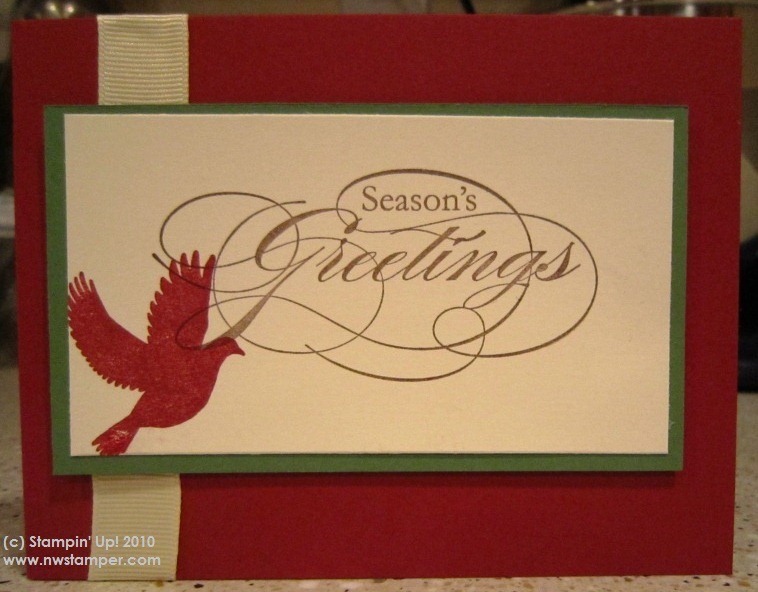 Due to Stampin’ Up! policy, I can’t prestamp any images for you but to help you out with that, if you get the kit and contact me to order any of the items not included in the kit, I will give you 10% off those items! So, for example, you could get the stamp set and/or the chunky glitter at a discount! I loved working on this project and I hope you do too! As promised, I have the last two cards we created at our Holiday Stamp-a-Stack (you can see the details on the first two in my post from yesterday). 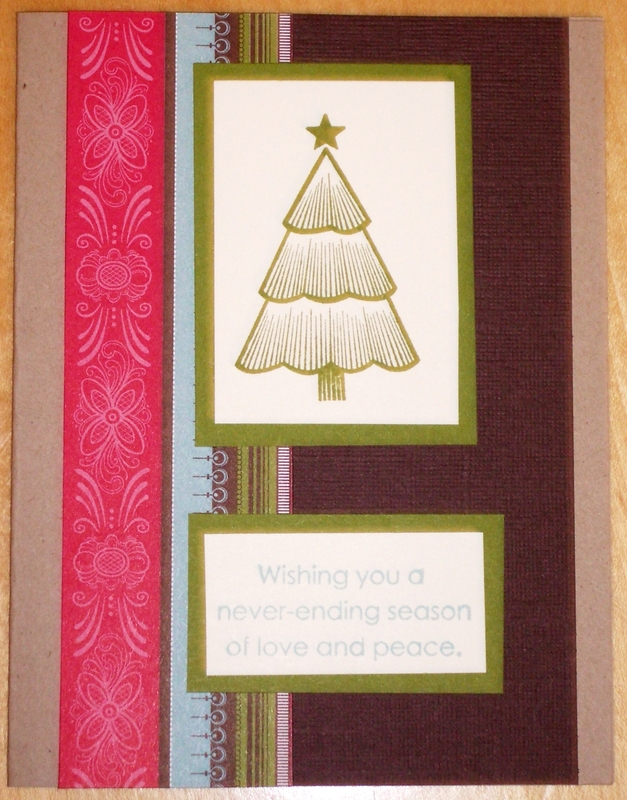 This card uses the Peaceful Seasons hostess set from the Holiday Mini. 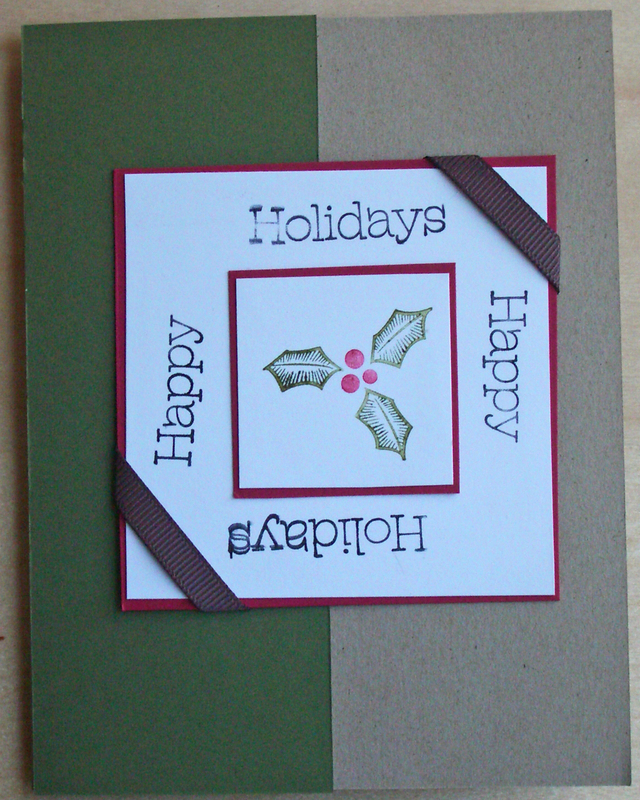 It’s a very simple and straightforward layout and so you could really use it for any stamps or holiday. 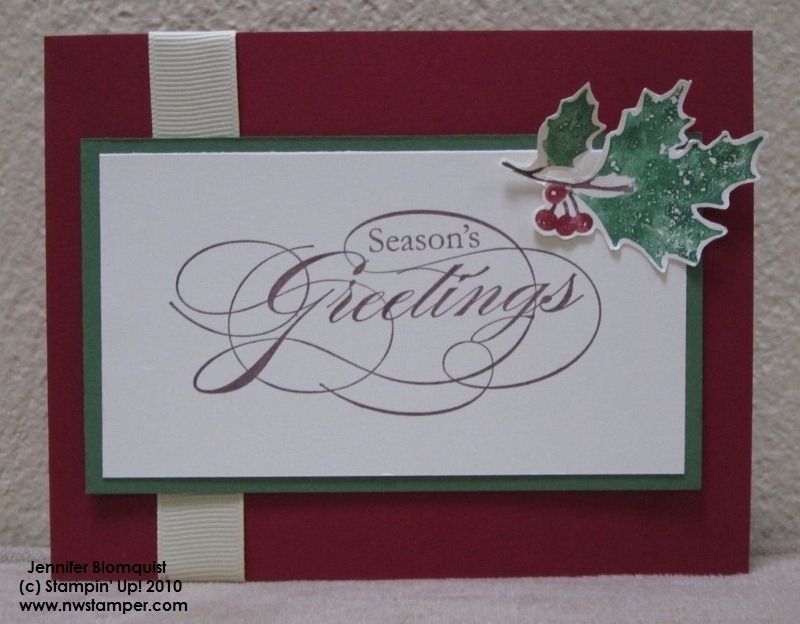 In this case, we popped the Garden Green and Very Vanilla cardstock up on Stampin’ Dimensionals in the center of the Cherry Cobbler cardbase, over some Very Vanilla 5/8” grosgrain ribbon. We also used markers to color in the holly image using Garden Green, Chocolate Chip, and Cherry Cobbler on Very Vanilla cardstock. Then we cut out the holly and adhered it straight down onto the corner of the matted image. In my sample, I only put Snail adhesive in the middle of the holly so that the edges could curl up and add some dimension without needing an actual dimensional. I swear, I always end up with way more ideas that I want to do for my classes and workshops than is practical. So, I decided that I really wanted to let everyone play with the new Tags til Christmas set and the matching Ornament punch. This stamp set is aimed directly at me because I love punches probably too much and oh my goodness when I see stamp sets that every stamp in the set matches a punch. This card is so fast and is still super cute in person. Plus add some of the adhesive rhinestones to the ornament or a little glitter for even more kick! 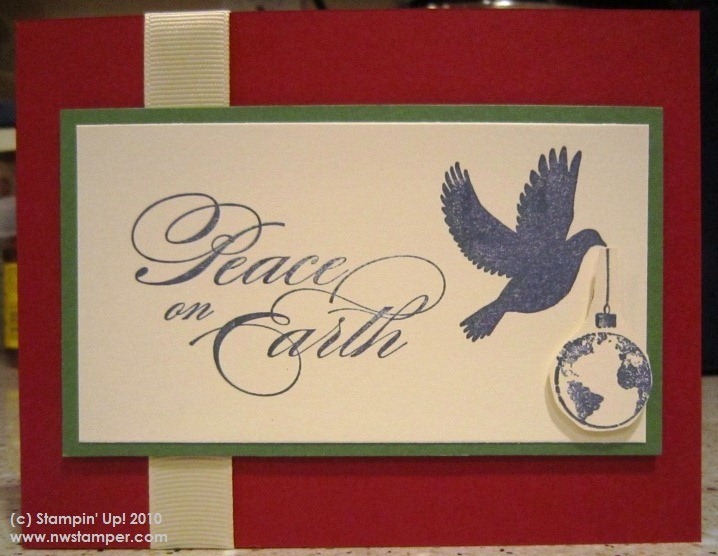 However, for this quick version, we stamped the ornament image from Tags til Christmas in Cherry Cobbler and punched it out using the Ornament punch. 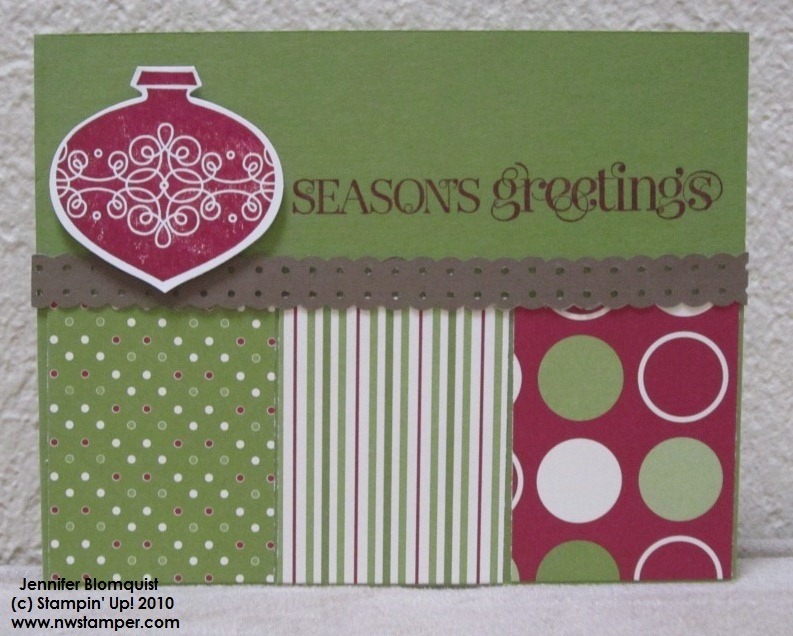 We adhered three patterns of the Jolly Holiday DSP to the bottom of the Old Olive cardbase and then added a piece of Soft Suede Cardstock that was punched with the Dotted Scallop Ribbon Border punch. Finally we stamped the sentiment from the Curly Cute stamp set in Cherry Cobbler and then adhered the ornament image using Stampin’ Dimensionals. 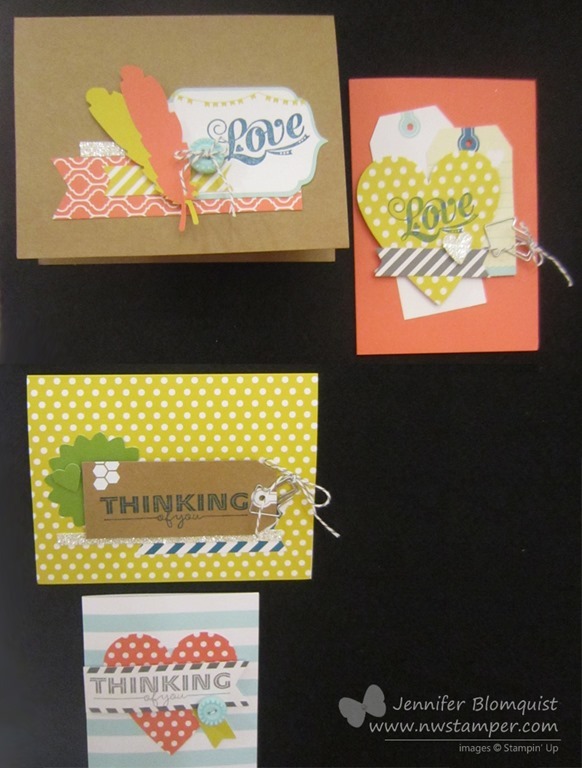 Want to make these cards? Join me on November 20th when I do this class again; or if you can’t make it, you can order the supplies though my online store or for an even easier and faster method, get the kit! You will get full color instructions, precut paper, scored cardbases, punched shapes, brads, ribbon, dimensionals, and envelopes – all for only $25 plus shipping. 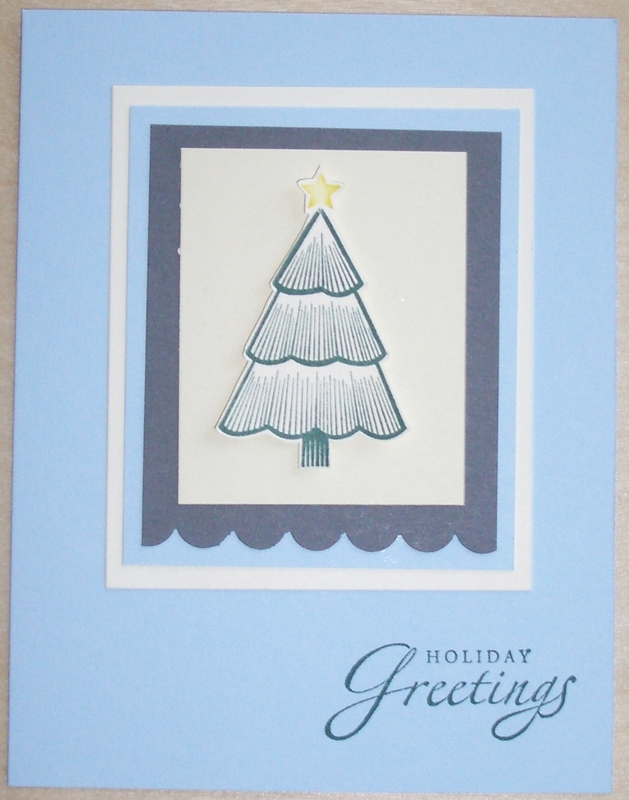 Its an easy way to get your holiday cards done without the hassle and leaves you time to add your own personal touch if you so desire. Plus, if you order this kit from me, you have the option of adding a bottle of Shimmer Paint for only $5! That is a 16% discount plus no additional shipping! So, my dear friend Kally has been making cards with me for a while and then posting her creative genius on her personal blog. Recently she came up with the idea to do some blog candy – because really, who doesn’t like a give away? So, she is giving away 5 handmade cards that she and I will be making. To enter her blog candy, she asked folks to visit my site, pick their favorite card and then leave a comment on her site with the answer. Isn’t that sweet of her? Well, one of her great friends left me a comment and has inspired me to add on an additional blog candy! The 5 card drawing will still be based off of her blog, but leave me a comment here with what your favorite type of creative project to make is and you’ll be entered in the bonus blog candy as well! Do you like cards? scrapbooking? 3D projects? something else? So, what treat do I have in store for you? 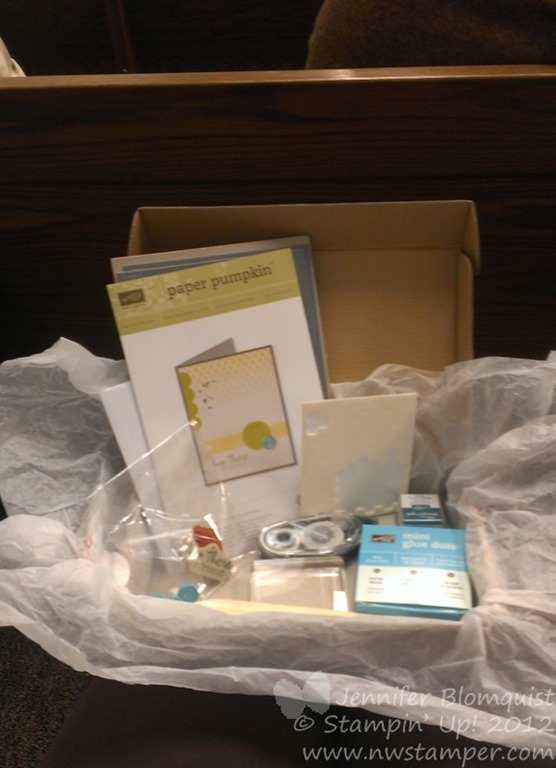 A small card kit! 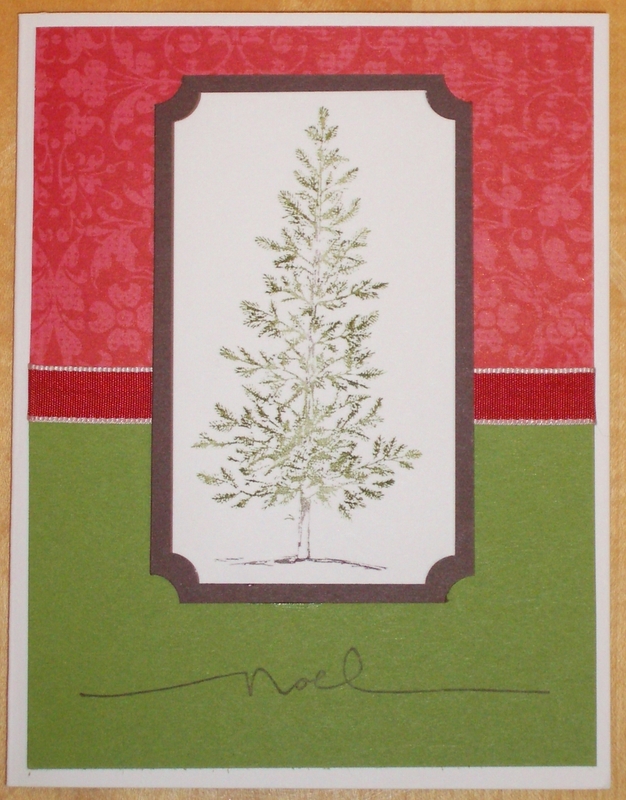 Thats right, I’ll send you the supplies and instructions to make a couple cards in the comfort of your own home. 🙂 I’ll randomly draw a winner monday,11/17 at 9am. Yes, you can win both so visit her site too! Look forward to hearing from you!